You have probably heard of storytelling. And, when it comes to your business, you want to tell customer, employee, and company stories in an engaging way. Creating words that resonate and matter to prospects and clients, and words that create a structure for ongoing content—blog posts, videos, brochure copy, and more. 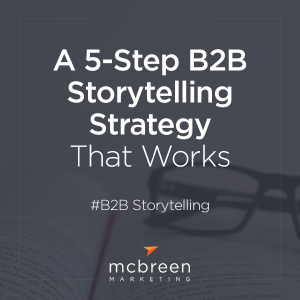 You want a B2B storytelling strategy that works. Brand storytelling can bring tremendous benefits to your business. Once you start writing, you’ll begin to find interesting stories you can easily tie to your business and your industry. Stories in daily news, industry publications, during everyday conversations, etc. And once you begin to tell an ongoing story, this all becomes routine. And this story routine is simply magic for finding and retaining great customers. Here is a 5-step strategy that shows you how to use storytelling in business. What does your audience really care about? Yes, they want and need your services, but what is it about your business that connects with them on another, deeper level? Make your audience care about your story. What is different about the way you do business? Think about how your company has evolved. The problems you solve and how it connects with the practical and emotional needs of your audience. What do you stand for? How do you see the world? This is your office culture, your diversity program, the one thing that makes your firm stand out. What your employees really care about. What truly makes you unique and valuable to your clients and the world around you. His wisdom in the “How to tell a great story” post from 2006 still holds true today. Developing content on an ongoing basis requires you to constantly think about your story—while listening to news, engaged in conversation, or reading trade publications. The more you pay attention, the more you’ll see how these other stories align with your Why, and it becomes easier to develop content on an ongoing basis. Start asking employees and clients to share 5-10 adjectives they would use to describe the firm. And 1-3 aspects of the firm that are truly unique or valuable. What is unique or special about your business? Your offering? How do you bring value and contribute to the world around you? What distinguishes the experience of working with you? What can customers get only from you? Drill down and think about the unique way you do things. If you’re a dynamic firm that will truly rock their world, tell that story in a way that will appeal to their emotions. Okay, you’re telling the world about your company’s secret sauce—created with your unique way of thinking, your people, your culture, your passion, and your vision. People will want to know how you arrived at this point. Does your brand have an origin? We can’t forget about a company’s back story that explains where you came from and how you arrived. Your heritage can be told in a variety of ways and to me another crucial element in brand storytelling is authenticating your story by anchoring it in the past. Maybe consider showing your company’s history in a visual way. Just make this story interesting. Start asking employees specifics about your company’s history that stand out. Ask partners to describe your company’s backstory. What is a baked-in philosophy that has always been a part of your company? What about our history distinguishes us? How can you take elements of your Why, your expertise, and your Brand Origin and blend them to tell a story? Look for recurring themes and combine them to form an ongoing story that speaks to clients and prospects. So, who is your hero anyway? To me, this is easy. Your client is the Hero. Think as a wise sage teaching clients and prospects how to solve their problem. Your services obviously do this, but you must first build trust through story. During this process, it helps to think more like a teacher and less like a marketer. Just work to make your customer the hero. Star Wars is a fairly modern incarnation of the “Hero’s Journey.” It’s based on a tried and true formula: a simple (familiar) story told on an epic scale (Luke’s journey from nobody to hero). But the meat of the story (Luke’s epic journey) is why the movie endures. The protagonist in Star Wars was Luke. The story was about his journey to greatness. From zero to hero. Your business? Well, the professionals at your firm are Obi Wan, of course. And it’s their job to make them (your customer) a hero. NOTE: I realize the grand nature of The Hero’s Journey and this type of epic storytelling (especially in blockbuster movies) is not always something a business can effectively pull off. It presumes you’ve mesmerized your audience and have the storytelling chops to make this all work. I know you can’t tell a story on a grand scale like this, BUT this is more about framework. Using an epic saga like Star Wars is really about providing you with a structure to make your customer the focus, and that’s the key. Simply remember that the customer is the hero of your brand story. You are simply the guide. This is how you find customer’s online. And how you truly master storytelling for your business. Start asking employees about the 5-10 top questions they usually receive from prospects. And what are questions clients ask again and again? Are there elements of your services that can be improved based on this? And, based on these answers, I’m sure you’ll start to develop content that focuses on your hero (your ideal client). What is your unique value to your clients? What distinguishes the experience of working with you? What processes or practices make it better? How can you take elements of your Why, your expertise, your Brand Origin, and your Hero and blend them to tell a story? Look for recurring themes and combine them to form an ongoing story that speaks to clients and prospects. The meat of the story (Luke’s epic journey) is why the film endures. The protagonist in Star Wars was Luke. The story was about his journey to greatness. From zero to hero. 4. Find your ideal customer’s pain point (a point of conflict) and use it! We are really talking about a dramatic arc here. And, while each video, blog post, or bit of copy might not have all of these elements, it helps to think in this context. So to me, this is the tip of the arc—a point of conflict, a challenge, or dilemma. It’s easier to think about this as an issue or challenge you solve for your clients. What keeps your clients awake at night? What battles are they fighting? More specifically, what is the antagonist that is hindering their progress? This also ties in with your story—the services you provide of course, but also your company, what makes it unique, why certain people work with you. What is the antagonist here? Let’s use a law firm as an example. In this case the pain point could be the extremely painful process of hiring legal counsel. Maybe some law firms are far too big and too expensive. Maybe some firms have too many layers of complexity. This point of conflict is about addressing the enemy of your client’s success. Another way to master storytelling in the B2B space. Who is the protagonist at your company? What are your clients’ main impediments? How can you better teach your clients? What distinguishes the experience of working with you in the context of solving the client’s problem? What makes you indispensable as experts who vanquish the antagonist? How can you take elements of your Why, your expertise, your Brand Origin, your Hero, and their Pain Point, and blend them to tell a story? Look for recurring themes and combine them to form an ongoing story that speaks to clients and prospects. Your clients will come out at the end of their experience with you better off. But again, it’s not just about the problems you solve, it’s about the experience. When it comes to client resolution, this is a very important point that many B2B companies don’t hit on correctly—how does solving your clients’ pain go beyond the services you provide? In doing the best for your clients, continually think about ways that you solve problems better than your competition. How a client’s experience with you will be better. What distinguishes the experience of working with your company? How do we resolve issues better than our competitors, both large and small? How does the uniqueness of the firm lead to better outcomes? How can you take elements of your Why, your expertise, your Brand Origin, your Hero, their Pain Point, and a Resolution, and blend them to tell a story? Look for recurring themes and combine them to form an ongoing story that speaks to clients and prospects. I think a good goal is to get your competitors to fall all over themselves trying to replicate what you have. And, while they are busy trying to copy what you’ve done, you can continue to focus on ways to innovate and improve the customer experience. You’ll always be the leader in your space, everyone else will be playing catch-up. Learn how to tell your company’s story in an effective way. This story is an ongoing one. One the your company will keep telling. It will evolve. And it will help you build your brand like nothing else. Do you want to bring your brand to life? Taking a few minutes to complete our brand audit will help you think about your current marketing efforts and what might need to change. It will also help me suggest several ways to improve your branding and marketing now: Brand audit. After you complete the form, we’ll contact you to schedule a time to go over the results and see how we can help. If you are interested in learning more about our marketing process, sign up for my email list below.